It's here! The cover for BREAKING THE ICE arrived right before I left for New York, so I've been sitting on it for what seems like forever. But now I get to share it with you! I am so in love with this cover, and could go on and on about it. Which I'll do after I show it to you. 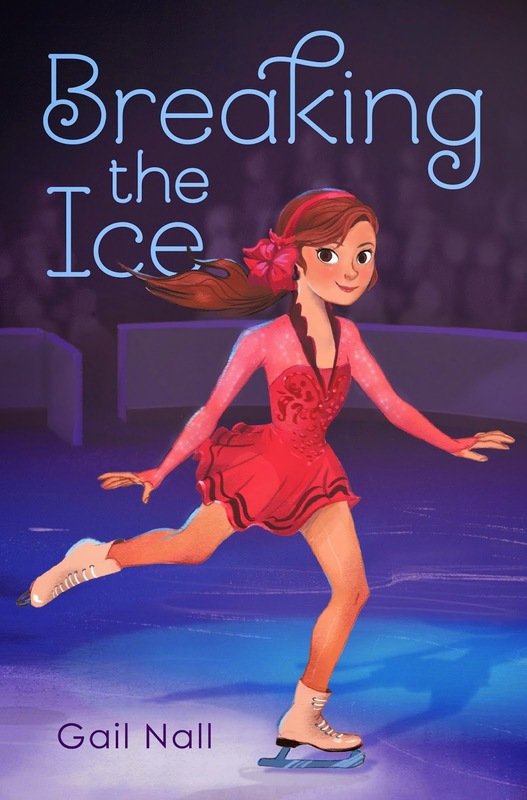 BREAKING THE ICE, for ages 8-13, will be out on March 3, 2015 from Aladdin/Simon & Schuster. You can add it on Goodreads here. Or, pre-order it from Amazon here. 1) The hands. They're skating-perfect! When I was Kaitlin's age, I had a coach who was all about the "pressing on a tabletop" hands. 2) The FLOWER! I want one for real life. I don't know exactly where I'd wear it, but I want one. 3) That dress is to die for. Twelve-year-old skater Gail needs it for her Rocky-themed program. She doesn't know how exactly this cute red dress matches the music from Rocky, but she wants it anyway. 4) The shadowy audience. Because this is exactly how an audience always looked to me when I was competing. I knew they were out there, but I never saw faces. 5) The expression on Kaitlin's face. So. Perfect! 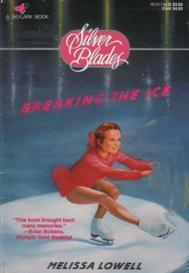 7) The eerie and awesome similarity to the cover for the first Silver Blades book. The artist is Andrea Fernandez, and you can find her on Tumblr here and on Twitter here. I'll tell you where you'd wear the flower- your launch party!!! And if you hold it at an ice skating rink, I'm flying down (especially if you include Zamboni rides) Seriously, though, this cover is magical- love the colors so much and the font is fantastic. I am glad you love it, Gail! I can definitely see your intended readers picking this up. Very bright and engaging. Congrats! What an adorable cover! I love it. I hadn't noticed it before, but the spotlight effect is beautiful. I love the way the light outlines Kaitlin and turns the ice shades of blue and purple. Great job, Andrea! Thanks Jean! I love the way the background makes the character really pop. So very proud of you!!!! Can't wait to read it and absolutely LOVE the cover!!!!!! This is awesome! Is it okay if I slip it into one of my blogs? Maybe Monday, so it will be seen by as many people as possible. Gorgeous Gail! I love the flower too. We should all wear flowers like this for your launch party! I'm going to go on a hunt for this flower. I also love the font they selected. The B and the K in 'Breaking' are all swirly worly like a skater doing spins. Thanks, Ella! Let me know if you find the flower. :D I love the lettering in the title, too! Gail, I'm so happy that the cover of your first book is PERFECT. I can't wait for your flower filled launch party! It's wonderful, Gail, and I love your insider comments that point out details I NEVER would have noticed. Congratulations! What a great cover! I teach a few die-hard skaters that would love this book. Congratulations! Nice cover, Gail! I'm so excited for your book's release! Awesome! I remember seeing this in contests - congratulations! Ice skating is an activity that can be practiced as a recreational activity or as a professional sport. A lot of skaters ice skate for leisure as there are some good benefits that can be gained from ice skating. Introducing children to ice skating can be both fun and yet dangerous as child safety on the ice rink is a major concern.